From the bed in my room at the Cecil Hotel, I see four locks on the door—a bolt, a button, two latches. Did they add the last after a 21-year-old tourist was found dead in the hotel’s water tank earlier this year? Did they add the third after “Night Stalker” Richard Ramirez slept at the Cecil by day and terrorized the city by night in the 1980s, murdering at least 13? Maybe it was when another resident, paroled Viennese “journalist” Jack Unterweger, strangled at least three prostitutes (and some undetermined number of earlier victims). Was the second lock installed half a century ago when 5th Street, a block and a half away, became skid row’s main drag, or when the Depression rendered the Cecil a transient way station, advertising weekly rates still emblazoned across 15 floors of the building’s brick side? Actually I can see the door locks from any place in my room because from any place in my room except the shower—at a rate of $98 a night, this is one of the hotel’s premium accommodations—I can see any other place in the room. A bed, a chair, a stool, and a small TV are the amenities at the Cecil, so old that when the front desk gives you a room key, it’s a key. At 6th and Main the hotel has become the locus for the downtown L.A. of the imagination as well as hub for all my memories of a hundred black-and-white B-movies and Dragnet episodes I watched when I was a kid in the Valley; this is the Nameless Downtown that stands in for all the anonymous downtowns flickering in the projection room of the collective conscious. Walk in the front doors that opened in 1924, through the marble foyer breathless so long ago with high hopes, and you come out the other end of a metropolitan rubble one or two recollections on the far side of forsaken. 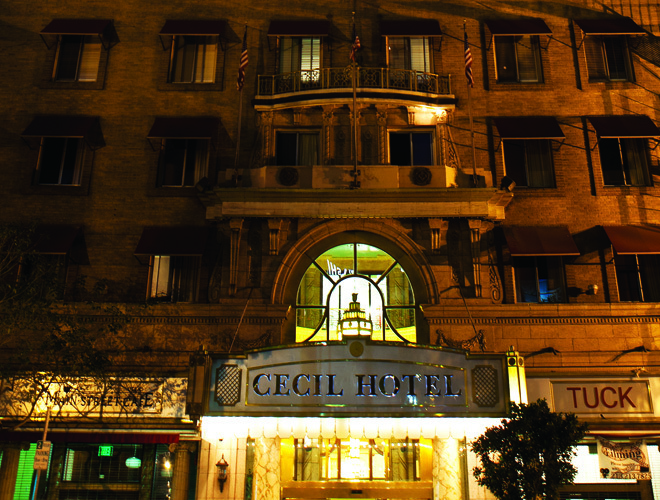 The dungeon of Angeleno cultural archaeology, the Cecil is to urban L.A. what the Chelsea is to Manhattan’s nether regions, halls inhabited not by junkie rock stars but prowled by strange men counting something on their fingertips, lips moving but silent. 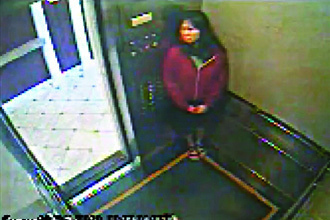 Elisa Lam hides in the Cecil’s elevator on January 31, 2013. I steal a DO NOT DISTURB sign from my neighbor and put it outside my room, because when someone knocks on your door at the Cecil, it isn’t room service. I have a soundtrack to keep me company within my room’s barren walls: Miles Davis’s “Générique” and the Touch of Evil score by Henry Mancini, David Raksin’s theme from The Bad and the Beautiful and Julie London singing It begins to tell round midnight, round midnight, I do pretty well, till after sundown. In the evening when I head out for Cole’s around the corner, a saloon (or “public house,” as a sign still calls it) opened in 1908, the hotel’s halls and downstairs mezzanine are filled with other languages, a reminder of how much noir L.A. was founded by exiles—middle-aged failures, desperate ingenues, Germans on the run from Hitler. If you aren’t at the Cecil to hide, or to look for the city you’ve occupied but never known, you’re probably a foreign traveler stranded by expectations, inconsolable for a glimpse of Hollywood or the beach that the travel guide promised is only “minutes away.” The Cecil hasn’t been minutes away from anything worth being minutes away from for decades. When I return from Cole’s, “my” DO NOT DISTURB sign hangs on another door down the hall; this is the floor’s most coveted item, as though the premises’ current psycho du jour will be diverted like the Angel of Death passing Egyptian doors marked with lamb’s blood. “It had to have been someone who works here,” a woman whispers to me in the elevator. She means whoever may have been involved in the accidental drowning of young Canadian Elisa Lam, missing three weeks and found in one of the four rooftop tanks only when guests complained about the drop in water pressure. She was last seen on a videotape in this same elevator pressing buttons—absently in a daze? or frantically in flight?—to close the door. “You can only get to the roof from the 15th floor with a key,” my fellow passenger elaborates between the eighth floor and the ninth, though there’s speculation Lam got there by the fire escape. The Cecil will reveal to you whatever it is you’re a fugitive from. Over the years women have leaped from these rooms to their deaths, one landing on the marquee, another on a pedestrian strolling by below, killing him; even the sidewalks of the Cecil are dangerous. Bolts and latches on the door will not only keep everyone else out but trap you within, where there are no locks at all on the windows, beyond which the siren city beckons. Steve Erickson, the film and TV critic for Los Angeles, is the author of nine novels, including 2012’s These Dreams of You. Photographs: Top, AP Photo. Inset: Los Angeles Police Department.